Candidates should possess 03 Years Professional/ 05 Years Integrated Degree in Law from any Law College or recognized University throughout the country with Computer Knowledge. INR Rs. 28,800/- (Post 1), Rs. 24,200/- (Post 2,3), Rs. 21,500/- (Post 4-6), Rs. 15,000/- (Post 7), Rs. 50,000/- (Post 8)..
General/OBC Candidates have to pay Rs.500/- & Rs.300/- for SC/ST category of UP (Peon/Orderly Posts) and Rs.750/- for General/OBC Candidates & Rs. 500/- for SC/ST category of UP (all Others posts) through Debit/Credit card, net banking OR SBI challan. 1. Applicants log on to the official website www.allahabadhighcourt.in. 2. 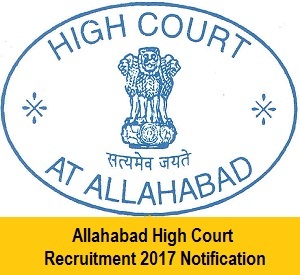 Now click on Recruitment section & click on Allahabad High Court Jobs Notification link. 3. Read all information from notification properly. 4. now click on apply online form link. 5. Make all the information from notification carefully. 6. Upload your recent passport size Photo & signature in form properly. 7. Recheck all details before submission. 8. Then submit Application fee & click on submit button.